The baking time was far too long for my dough. No idea what went wrong. So I ended up with almost burnt logs, that were still so soft in the middle, that one of them broke up. How could that happen? Either I did bake it too long (would be an explanation for the almost black surface) or too short (what would be an explanation for the softness in the middle) - but both at a time? Then I tried to cut them, what was impossible for about 2/3 of the dough. Putting them back in the oven, for consolidation, it was clear that I had to shorten the baking time. Still, even 5 min. was too long. So I ended up with about 6 or 7 acceptable biscotti, some "when I am generous you may call them mini-biscotti"-pieces and a whole lot of crumbs.Well, let's store them and make some cookie-icecream soon! Nevertheless: The crumbs I tested did taste great. 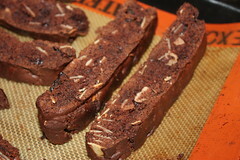 Biscotti dough with chocolate, almonds and dried cherries - a wonderful and excellent flavour combination. So don't blame the cookies for my lack af baking-abilities! Sorry I can't give you better pictures for these (Cherry) Chocolate Biscotti, chosen for this week's TWD by Jacque of Daisy Lane Cakes. On her page you will not only find the recipe, but far better pictures! Sorry they didn't work out! I wonder if your oven is off or something? I added sour cherries to mine and it was a great addition! i really like the slivered almonds peeking thru. mmm. Oh no! My first biscotti were a fail, too, but yours don't look that bad! I'm sorry that you had trouble with these. They look like they're delicious! Perfect idea to save the crumbs for cookie ice cream. I really have to watch my oven when I bake. Sometimes it says, Not Today! !